If you'll be releasing your self-published book sometime soon, you've probably wondered whether or not to throw a book launch. You might have been asking yourself whether it's even possible to throw a successful book launch as an indie author. After all, you're a writer, not an event planner! Well, we're here to tell you that it is possible – and that putting on a great book launch is an excellent way to drum up interest and sales for your book. Plus, you've worked super hard to get this book out into the world – you deserve to celebrate. Here are nine handy tips for planning a successful book launch. The first thing you need to do when planning a book launch is set yourself a budget. As an indie author, you probably don't have a whole lot of cash to sling around on over-the-top parties, so this is a really important step. Remember that your book launch doesn't have to be expensive or fancy in order to be successful. How much you want to spend is up to you, but keep in mind that a simple, well-thought-out launch can be effective without being too costly. Be wary of getting carried away during the planning process and consequently blowing your budget. Refer back to your figures throughout the whole organisational process, and remind yourself that your guests aren't expecting a giant Gatsby-style party! Keep things simple, stick to your budget, and you'll thank yourself later. 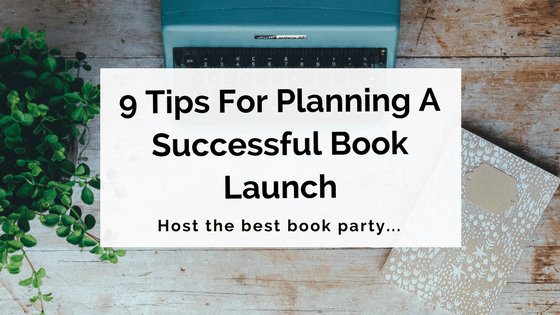 When planning your book launch, you'll need to decide whether you want it to be a public or private event. This really comes down to a personal choice, and a consideration of what you want your book launch to achieve. If the main thing you want is a nice night to celebrate your book with family and friends, perhaps an invite-only event will be best. If you'd like to use your book launch as more of a means of promoting and spreading the word about your book, consider hosting a public event. If your book launch will be open to the public, you need to promote well ahead of the date. Start as far in advance as you can, and ramp up your promotions as the launch gets closer. Make sure you send out a press release, create an event page and talk about the launch on social media. You can even send out direct invites to local influencers you'd love to see at the launch. Many authors choose to partner with a retail venue such as a bookstore, who will host the event and sell books for you on the night (more on sales below). A library is a similar option – obviously, any venue where guests will be surrounded by books creates a suitable atmosphere for a book launch. There are certain limitations when hosting your event in a bookstore or library, however: venue size, availability and practicality of serving food/drinks, to name a few. Luckily, there are several alternative options to consider. Ask around at some of your local cafes or bars to see if they'd be interested in hosting your book launch. You might be able to strike up a deal in terms of food and drinks, as well as the exclusivity of the space you'll be occupying. This option is great for a more 'casual'-style launch, or if you aren't expecting or inviting a whole load of guests. Many local venues will have function rooms available for hire, which can be perfect for an event like a book launch. A private function room is especially handy if you're expecting quite a few guests and would prefer to have a space that's completely your own to host the evening. Obviously, you'll incur some extra costs with this type of venue, but it may be worth it for the privacy and ease of organisation. A creative approach to choosing a book launch venue is to match it to an aspect of your book – some element of setting, plot or character. If, for example, your book is set in Spain, you may choose to hold your launch at a Spanish tapas bar. Similarly, if your main character is an artist, you might seek out an art studio space to rent for the evening, or approach an art gallery to enquire about hosting your event. If you host your launch in a bookstore, the staff there will most likely take care of the sales side of things. However, keep in mind that if you choose this option, you'll effectively be splitting a percentage of the profit with the bookstore itself. If you get your books stocked in a bookstore, they'll purchase copies at quite a significantly reduced rate so they can make their own profit. Also, most bookstores operate on a sell-or-return policy, meaning that if any copies of your book aren't sold, they'll eventually be returned to you at your own cost. You should offer both these options to make it as easy as possible for people to buy your books at the launch. You'll need to have a change float on hand for cash purchases. A calculator is always handy too, so you can provide change quickly and easily. Most people prefer to purchase things via card these days, so make sure an electronic payment option is available as well. You can purchase a small portable device to accept electronic payments, or, depending on what type of smartphone or tablet device you own, there may be an app to help you process payments. Consider offering some deals or discounts with certain purchases. You may want to incentivise multiple purchases – for example, by offering a 'buy one, get one half-price' deal or something similar to encourage people to buy copies for friends and family as well. Offering little extras with purchases is also a good option. One of our best tips for indie book promotion is to have 'book swag' – things like bookmarks, pins and tote bags emblazoned with your book cover, quotes etc. Consider slipping a bookmark in with each book purchase, or offering a deal such as 'X books purchased gets you a bonus tote' or something similar. Who will be in charge of the sales table? While it's nice for you to be able to sell books directly to your readers, having a chat and signing as you go, you shouldn't be the sole person manning the sales table. As the author, you don't want to be stuck behind a table all night. You want to be able to move around and mingle, talking to different groups of people and making sure things are all running smoothly. For this reason, it's best to have at least one other person helping you out with sales. Enlist the help of a trusted friend or family member who's happy to be in charge of the sales table for most of the night. This will ensure that there's always someone there to process sales, even when you're out amongst the crowd and performing your other author duties. To ensure everything goes smoothly on the night of your book launch, it helps to have a run sheet prepared. A run sheet is a rough timeline of how you want the evening to proceed. You don't have to follow it down to the minute, but it is useful to have a general idea of the evening's time frames on hand. 6:00: Event starts. Be on hand to welcome guests. 6:30: Hors d'oeuvres begin to circulate. 7:15: Any competitions or prizes are drawn and awarded. 8:30: Music and mingling until the end of the night! A schedule, even if it's not strictly adhered to, will ensure the event progresses smoothly and that you fit in everything you want to accomplish. Yes, there's no getting around it: you're going to have to make a speech at your book launch. If you hate public speaking (as many people do), don't worry. Your speech doesn't have to be long; in fact, it's better if it isn't. Keeping things short and sweet is the best way to go. And remember, it's likely that most of the attendees will be people you know: friends, family, people who are there to support and celebrate you. Keep that in mind if the thought of delivering a speech starts to scare you too much. To minimise nerves on the day, it's best to have your speech prepared and even practised before your launch. Have some notes to refer to if you get lost, but try not to read directly from them. Look around – aim your gaze just above people's heads if making direct eye contact is distracting or uncomfortable. Above all, just remember to breathe – it's likely that your speech will be about four or five minutes at the very most, and it'll be over before you know it! Do I need to do a reading? The reading of an excerpt from the book is a common element of many book launches. You don't have to do a reading if you don't want to, but it can be a nice accompaniment to your speech on the night. If you do choose to read an excerpt, choose a section that will interest people, but that doesn't give too much away about your book. The first few pages are always a good option. As with your speech, try to keep things short and sweet here – we're talking a few minutes, max, not a half-hour dramatic reading! A fun way to get everyone involved at your book launch is to have some prizes on hand to give away. Obviously, the book itself is a great prize, but you don't want to give away too many of those! People are more likely to be willing to buy your book on the night, so give them the chance to do so. We talked about 'book swag' above – items like these also make for great prizes at a launch, as they're relevant to the book and less costly to give away. Your prizes don't all have to be relevant to the book, and they don't have to be expensive, either. Simple giveaways like a 'lucky door prize' or some form of light-hearted competition are perfect for a book launch, and will add interest and a bit of fun to the night. Word of mouth sells books, and there's no better word of mouth these days than a like or share on social media! Promoting your book launch online can really help to drum up some interest and attention in the early days of your book's publication. Take photos on the night to share on social media, and encourage your guests to do the same. You might even like to set up a dedicated hashtag for the launch (try #[nameofbook]launch or something similar), and perhaps even incentivise guests to use it by offering a prize for the best photo shared. We've saved the most important piece of advice for last. This is your night, so remember to relax and enjoy it. We completely understand the stress and hard work that goes into organising and pulling off a successful book launch. But it's so important that you don't spend your whole night fretting about how things are going. Plan and prepare well in the lead-up to your book launch, and you'll be free to celebrate and enjoy yourself when it finally arrives. Writing and launching a self-published book is no mean feat – you deserve a reward for all your efforts, so let this be it! Have you hosted a launch for your own self-published book, or have you attended other indie authors' book launches? Feel free to share your own tips and ideas about what does and doesn't work below! Thank you for this considerate article! What Divine timing as I have been planning my book launch (one and only) for August 18, 2017. After months of planning, most of my details are in place however, with 4 days to go, nerves are kicking in big time so this was perfect! Just wanted to say what a great article this was! Still in very early stages of self publishing but I’ve noted every step! Think finding the right venue will be the trickiest…! All the best with your writing and publishing! Thanks Claire for this great peace. I am having my book launch in a month’s time and stumbling on your article just made my day. God bless you for making this information available to the world. Now I can put my book launch in perspective..
You’re very welcome! Pleased to hear the post has helped you with your planning. 🙂 All the best for the launch next month! This was very helpful! Thanks so much! I’m preparing for a book launch team and perhaps a book launch event in the new year! Looking forward to it all! Just read your article on book launching and got a lot of interesting snippets from it. Just waiting on my book to me delivered, (they started printing last week) and yes, going to have a book launch for friends and friends and friends in early November.. Love the idea of little gifts, actually have a lot of parties and play games that everyone loves), so some great tips..
Having my book launch in a week! Your article was tremendously helpful, especially your point on breaking down the speech/reading.